Android is still surging, growing to 79% of all shipped smartphones in 2013, but the dominance of Google’s mobile ambitions is slowing. According to Canalys, Android grew from 68% of all smartphones shipped in 2012 to 79% in 2013, while iOS dropped 5%, from 20% to 15%, in the same period. Windows Phone increased to 3% of the nearly 1 billion overall smartphones shipped in the year, with a 90% uptick from the prior year; the overall numbers were 32 million. The numbers were echoed by Strategy Analytics, and both analyst firms confirmed the impending doom of BlackBerry’s handset business, which declined precipitously in 2013. 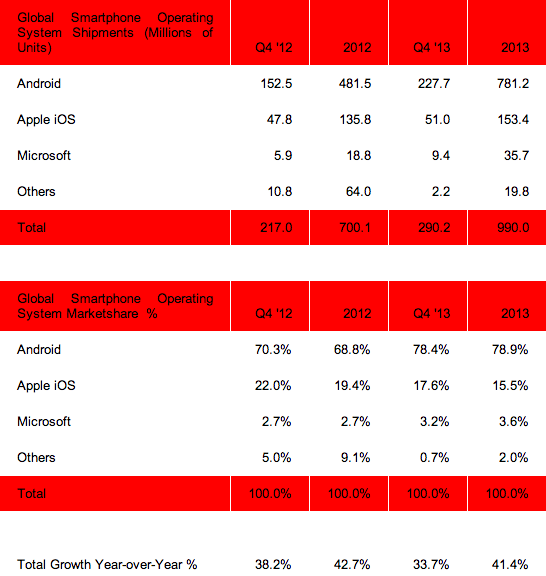 A reminder, though: smartphone shipments market share does not equate to usage share, as is often reiterated. While Google excels at getting Android onto hundreds of millions of devices each year, many of them are either used as “dumbphones” or do not end up accessing the Google Play Store.